Before I get in to this I would genuinely like to thank all those people that took the trouble to find me at Portsmouth just to say how much they liked my little corner in this magazine and have been following the story of Marilyn and I becoming involved with kites – I won’t mention any of them by name in case anyone questions their sanity! In the last two issues (127 and 128) I covered off up to our first festivals and up to our first three sport kites. We now had a vented Jam session for the high wind days at Danebury Ring where we used to fly before the constant use of the field by nosey sheep or cows that came over to see what we were up to then tried to walk all over our stuff on the ground. Problem was that best hollow carbon fibre around at the time was 6mm pultruded and there just wasn’t enough flex in the bottom spreaders before they split so I soon got fed up of replacing rods. The Jam had encouraged me a little down the trick route though, so by the time winter had passed I was already trying to decide between a Benson Box of tricks and the Chris Matheson Sandpiper midi. There we were, at Weymouth, our first festival of the year, looking at all the trick guys on the beach and there was one guy flying the BOT turning my head towards it – he was good, very good – I didn’t know at the time that it was actually Tim Benson. Making our way down to the Kiteworld stall we recognised Chris Matheson and stopped him (silly or what?) to ask his opinion on which was the best kite to learn tricks with – oddly enough, we went home with a Midi; but hang on, who was that guy with the horseshoe shaped kite on the beach with the lovely tails making it fly in all directions. We had been impressed with the long haired Simon Dan showing his skills and the accuracy of that four line Revolution thingy by standing it on the scaffold poles by those two funny blokes in the commentary box, but this kite to us, as mere novice spectators, was nothing short of amazing – we just have to have one! How strange that we would eventually get to know all these lovely people so well. We mastered our new SkyDancer after we discovered that it was easier to fly with the tails on and became firm friends with designer and maker Dave Davies often visiting his house and trying out some of his new ideas at his local field – I think that I have the only collapsible centre leading edge so that I could fit it in my suit case and show it off in San Diego. I would often get a call from David to meet up with a recent client and give some simple guidance before they started to make unnecessary adjustments. 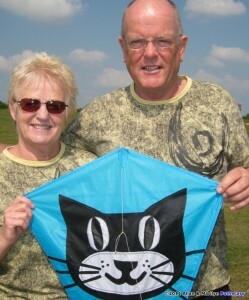 99% of kites are correctly put together when they leave the factory and 99% go wrong when new owners don’t believe that. Dave was a bit upset when we bought our first Rev but we craved the precision it provided. I even got David to fly it once but he said that he was not impressed and refused to believe that anyone could better his kites. The sail on that Rev rotted after I had dipped it in the sea a few times but I arranged (through various channels) to get it exchanged. During these communications I struck up a rapport with Lolly who invited us to the Rev factory next time we were that way. When we got there (about fifteen miles north of San Diego) Lolly had been given some basket ball tickets at the last minute and had gone – One of the brothers came out to say hello but we weren’t allowed to look around. I was one of the first to ask for brighter colours in our new rev sail – they were quite put out when I told them that their colour schemes were boring. Whilst all this was happening I was arranging my work calls so that I finished my day within easy reach of the Kennet Kite club’s Wednesday night fly in. This gave me the chance to fly with others and experience my biggest kite flying thrill to date when I joined in with Spud, Glen and Dave for a team fly. If you are starting out then flying pairs or especially team, is a big hook to drag you in to kites. Later I was lucky enough to fly in some larger teams on fun days out –or after a league meeting. These teams were often led by Cathy Jarvis or Carl Robertshaw – I am so grateful – these guys were the best flyers around and I learned everything I know about team flying from them. I took a few rollickings from Cathy about team discipline but it was worth it! One of the stories I still tell is how accommodating kites flyers were – (and I hope still are). Guys at higher skill levels were always willing to let you join in and advice was always aplenty! I went up to Carl Robertshaw – I didn’t know him as well then – just as he was preparing to go in to the arena for a round of the European quad-line championships (I didn’t know any better). I was asking about the set up and Carl told me he liked to have lots of brake and passed the handles to me. You have got to be joking!!! He didn’t even know if I could fly and he was on in a minute! Would Steve Davies (it was a long time ago) let you use his cue just before a snooker competition??? Our club had been holding winter leagues and I had watched with interest at how they were judged on the figures they made in the sky and began to understand the difference between a good and mediocre performance. I thought that I would like to have a go at the next one and although I had practised the figures I was so nervous, I looked for the slightest excuse for why I shouldn’t take part. After watching everyone else, oh how I wished that I had not bottled it and went home quite mad with myself. After some more practice and a little encouragement from fellow club members I got up enough courage to fly at the next one. Even some of the experienced flyers were nervous – I remember that Spud always wanted to swap with the person who drew to go on first so that he could get it out of the way. I don’t think I came last in the novices – the judges go through what you needed to do to get better marks next time and I went home buzzing. I eventually made my way through the novice ranks and made it to the final in Blackheath where, to my great surprise, flew reasonably well whilst others made some silly mistakes allowing me to gain my first title! I can’t describe how much it improves your flying skills and understanding of kites if you have the target of a competition. Craving more, I joined STACK, spent all my time practising and was fortunate enough to fly well when others were having bad days and in successive years won both individual novice and experienced national tiles. The second year was extra hard work because, by this time, I had managed to persuade Marilyn to fly in pairs with me so I was coping with singles and pairs on the same day. I’ve just checked and I have written 1296 words so, not to risk being too boring, I will continue in the next issue – if you’ll let me? This entry was posted in Kite Columns, Kiting Experience, KL Archive and tagged Matheson, robertshaw, starting.